Introduction: The etipathogenesis of inflammatory bowel disease (IBD) includes immunologic, genetic and environmental factors. In addition to the colon, frequent extra-intestinal alterations related to pancreas and hepatobiliary system are evaluated in several studies. A minimally invasive approach was applied to the IBD, with the expectation of earlier recovery, fewer postoperative complications.. 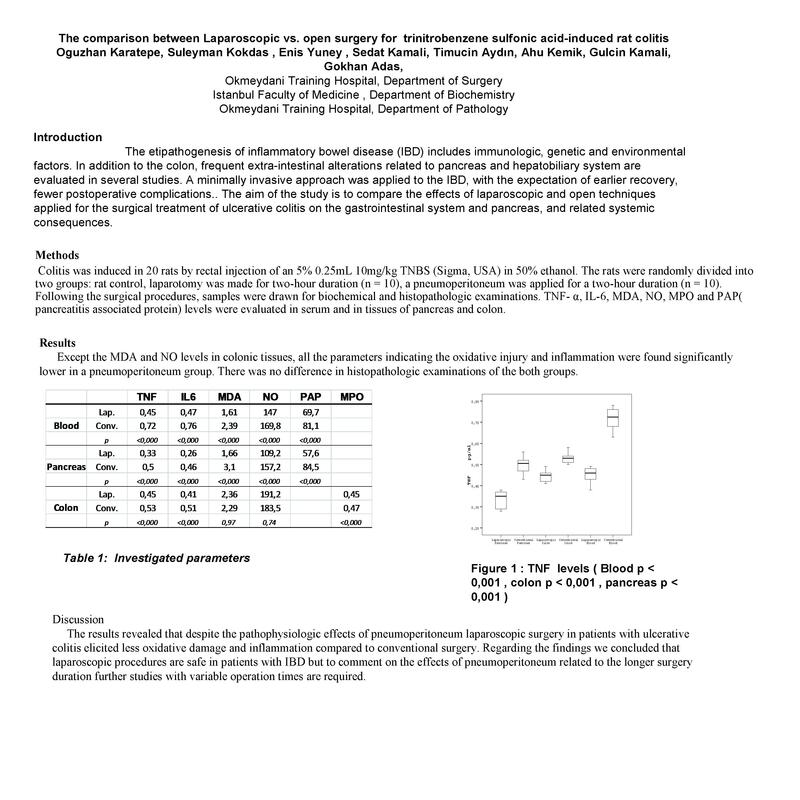 The aim of the study is to compare the effects of laparoscopic and open techniques applied for the surgical treatment of ulcerative colitis on the gastrointestinal system and pancreas, and related systemic consequences. Methods: Colitis was induced in 20 rats by rectal injection of an 5% 0.25mL 10mg/kg TNBS (Sigma, USA) in 50% ethanol. The rats were randomly divided into two groups: rat control, laparotomy was made for two-hour duration (n = 10), a pneumoperitoneum was applied for a two-hour duration (n = 10). Following the surgical procedures, samples were drawn for biochemical and histopathologic examinations. TNF- a, IL-6, MDA, NO, MPO and PAP levels were evaluated in serum and in tissues of pancreas and colon. Results: Except the MDA and NO levels in colonic tissues, all the parameters indicating the oxidative injury and inflammation were found significantly lower in a pneumoperitoneum group. There was no difference in histopathologic examinations of the both groups. Discussion: The results revealed that despite the pathophysiologic effects of pneumoperitoneum laparoscopic surgery in patients with ulcerative colitis elicited less oxidative damage and inflammation compared to conventional surgery. Regarding the findings we concluded that laparoscopic procedures are safe in patients with IBD but to comment on the effects of pneumoperitoneum related to the longer surgery duration further studies with variable operation times are required.